Professionals in the health care, legal, and financial services industries are turning to hosted phone services to extend their current PBX functionality or replace their current phone system all together. At Sim-phony, we have been busy with hosted telephony and the delivery of commercial grade phone services for more than a decade. Our experience has taught us many things as it relates to the delivery of a reliable and high quality sounding voice solution! A solid understanding of network design and configuration is a fundamental requirement because any VOIP or Telephony solution is dependant on the underlying network. At Sim-phony network design and configuration knowledge is a given. Most of our customers arrive because they want to save money on their current telecommunication expense or they have a particular need to extend their current telecom investment; deliver more value or integrate voice to their business processes! Either way, our customers enjoy the entire package; Sim-phony’s extensive experience in hosted telephony delivers the value our customers are seeking in a dependable and high quality sounding solution. No matter what you hear from any VoIP Service provider, we will tell you this “plug & play” does not exist when it comes to VoIP. At a bare minimum Sim-Phony will review the following areas to insure the final solution we recommend and eventually provide meets your needs, is reliable, and delivers the utmost in sound quality. Sim-phony’s hosted phone services come complete with the functionality of a virtual PBX and the convenience of a true toll free 1-8XX number, giving small businesses, regional offices, home offices and mobile professionals the same capabilities of a large corporation without having the expense of maintaining any PBX hardware or in-house expertise. Our analysis is simple, tell us what you are trying to achieve with your phone system and provide us with a copy of your latest phone bill. With in 48 hours, we will provide you with a written recommendation and the amount of savings we can provide to your company on a monthly basis. Sim-phony can configure your phone service to meet your current needs. As your requirements change, we can add additional services. Do you need “call centre” functionality? Do you need “call recording” features? 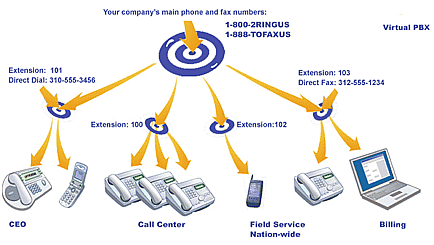 Do you need telephone calls “routed” to specific remote agents? Do you need to “integrated data” from the phone into your business process? Sim-phony has many solutions that can help your business succeed, efficiently.